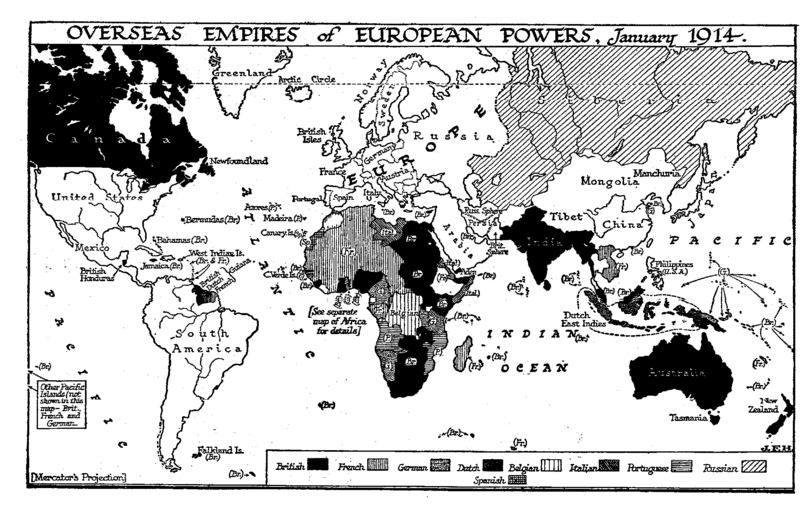 For thirty-six years after the Treaty of San Stefano and the Berlin Conference, Europe maintained an uneasy peace within its borders; there was no war between any of the leading states during this period. They Jostled, browbeat, and threatened one another, but they did not come to actual hostilities. There was a general realization after 1871 was a much more serious thing than the professional warfare of the eighteenth century, an effort of peoples as a whole that might strain the social fabric very severely, an adventure not to be rashly embarked upon. The mechanical revolution was giving constantly more powerful (and expensive) weapons by land and sea, and more rapid methods of transport; and making it more and more impossible to carry on warfare without a complete dislocation of the economic life of the community. Even the foreign offices felt the fear of war. But though war was dreaded as it had never been dreaded in the world before, nothing was done in the way of setting up federal control to prevent human affairs drifting towards war. In 1898, it is true the young Tsar Nicholas 11 (1894-1917) issued a rescript inviting the other Great Powers to a conference of states, «seeking to make the great idea of universal peace triumph over the elements of trouble and discord». His rescript recalls the declaration of his predecessor, Alexander I, which gave its tone to the Holy Alliance, and it is vitiated by the same assumption that peace can be established between sovereign governments rather than by a broad appeal to the needs and rights of the one people of mankind. The lesson of the United States of America, which showed that there could be neither unity of action nor peace until the thought of the «people of Virginia» and the «people of Massachusetts» had been swept aside by the thought of the «people of the United, States», went entirely disregarded in the European attempts at pacification. Two conferences were held at, The Hague in Holland, one in 1899 and another in 1907, and at the second nearly all the sovereign states of the world were represented. They were represented diplomatically, there was no direction of the general intelligence of the world to their deliberations, the ordinary common man did not even know that these conferences were sitting, and for the most part the assembled representatives haggled cunningly upon points of international law affecting war, leaving aside the abolition of war as a chimera. These Hague Conferences did nothing to dispel the idea that international life is necessarily competitive. They accepted that idea. They did nothing to develop the consciousness of it world commonweal overriding sovereigns and foreign offices. The international lawyers and statesmen who attended these gatherings were as little disposed to hasten on a world commonweal on such a basis as were the Prussian statesmen of 1848 to welcome an all German parliament over-riding the rights and «policy» of the King of Prussia. In America a series of three Pan-American conferences in 1889, 1901, and 1906 went some way towards the development of a scheme of international arbitration for the whole American continent. The character and good faith of Nicholas II, who initiated these Hague gatherings, we will not discuss at any length here. He may have thought that time was on the side of Russia. But of the general unwillingness of the, Great Powers to face the p rospect of a merger of sovereign powers, without which permanent peace projects are absurd, there can be no sort of doubt whatever. It was no cessation of international competition with its acute phase of war that they desired, but rather a cheapening of war, which was becoming too costly. Each wanted to economize the wastage of minor disputes and conflicts, and to establish international laws that would embarrass its more formidable opponents in wartime without incommoding itself. These were the practical ends they sought at the Hague Conference. It was a gathering they attended to please Nicholas II, just as the monarchs of Europe had subscribed to the evangelical propositions of the Holy Alliance to please Alexander I; and as they had attended it, they tried to make what they conceived to be some use of it.